07-Mar-2008 -- We began our trip in Ouagadougou at 10:30 a.m. with the intention of only visiting the last two "unclaimed" confluence points in Burkina Faso. When we stopped at the gas station in Fada, the station attendants warned us of bandits on the road heading towards 13N 1E. We decided on a detour and instead we turned north on the N18 towards Bogandé to register a complete visit of this particular point (13N 0). After leaving Fada, the journey on rural roads, donkey cart paths, or bicycle tracks left us longing for paved roads! Just south of Bogandé we turned east on the R7 towards Liptougou. We followed this dirt road until we made no further forward progress towards the point. Turning north we made our own path (about 4 miles) through fields and open terrain. At 4:55 p.m. we parked the truck .4 miles from the point. After taking the required photographs to document the visit, we made the short walk back to the truck. Upon leaving, we located a donkey cart path which led directly to the R7. Since it was dry season we didn't have any of the trouble mentioned in the previous visit. 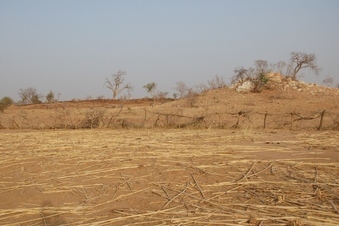 Because of concerns about bandits, we drove down the R7 to just beyond the village of Samou. As the last rays of light from the sun faded away, we parked the truck in a relatively protected area with no visibility from the road. We made camp and enjoyed a star filled sky all night. This point was the first of four confluence visits on this expedition. Read the continuation at 13N 1E.